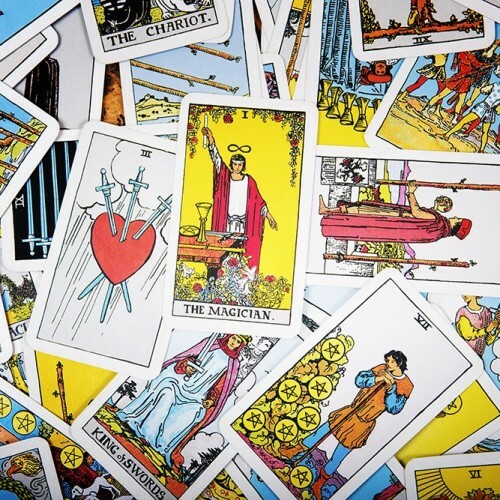 Tarot cards are richly illustrated playing cards used for divining the future and answering questions. A tarot pack is divided into 56 minor cards (the Minor Arcana), which is divided into four suits: wands (clubs or staves), cups, swords, and pentacles (or coins), and the 22 cards of the Major Arcana such as The Magician, The High Priestess and The Wheel of Fortune. The querent (questioner) asks a question out loud or keeps it in mind whilst shuffling the deck and returning it to the reader, who will then lay out the cards in turn - usually in a pattern called a 'spread'. The reader then interprets the meaning of the cards in relation to their position within the spread. For example, one card may symbolise people helpful to the querent; another may symbolise the outcome of the question. Tarot can be used when facing a difficult choice or when seeking direction. A skilled reader will not only understand the meanings of the cards but will use their intuition and wisdom to guide you on the next step of your journey.